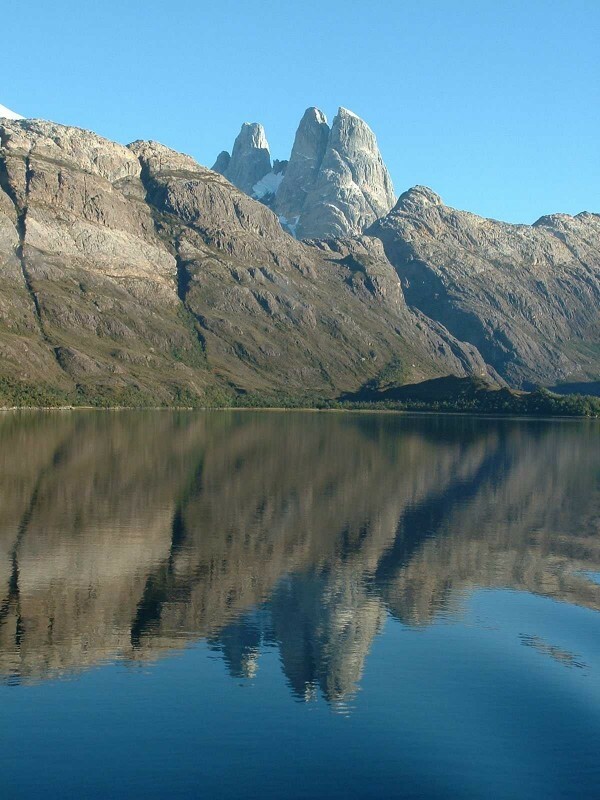 By Travis - Argentina - 31 Mar/03 - Viewed 1725 times. After an excrutiating bus ride from Ushuaia to Puerto Natales and hanging around waiting in internet cafes and restaurants the next day, we boarded the Navimag ferry Magallenas at 9:00 p.m. on Thursday. After finding our cabin and taking a quick tour of the ship, we watched Gladiator on a 4 foot by 4 foot movie screen set up in the dining hall and then went to bed. The next morning we got up about 30 minutes before sunrise and were amazed with the scenery even then. About 30 minutes after the sun broke over the horizon, and cast a shimmering lane of fire on the water behind us, we went through White Pass, at 80 meters wide it was the narrowest channel of the trip. Here four or five dolphins swam along with the boat for a few minutes. There were steep fjords extending into the main channel, rocky islands with sparse trees along the way, glacier peaked mountains in the distance; this morning was by far the best scenery of the trip. Unlike most of our time in Patagonia, there wasn't a cloud in the sky, and it stayed that way for all three days on our way to Puerto Montt. At a couple of points along the trip, we spotted whales, or at least the plume of water as they surfaced and exhaled. There were also lots of sea birds and ducks and playful sea lions (otters, depending on which of the travelers you spoke with). After dinner, we would go outside and find a dark corner of the ship and look at the incredibly brilliant stars (we even saw a couple of shooting stars). The staff on the ship had several interpretive talks about the geology, plants and animals of the area. There were also one or two movies that they showed each day (quite a variety with What Women Want, Training Day and Casablanca) and they served us breakfast, lunch and dinner. One of the most enjoyable parts was being with the same group of approximately 70 people for three days and sharing travel stories and other experiences. We got to know couples from England, Denmark and Chicago pretty well and hope we run across them again during our trip. There was plenty of time to read, sit on the deck in the sun and relax. It was a nice change of pace for this point in our trip.